for Canadian Grand Trunk Railway and Canadian Mining Syndicates, 1900s; worked for industrial entrepreneur William MacKenzie, searching for iron ore deposits along Hudson Bay, 1910–16; made first travelogue film, 1915; made first feature, Nanook of the North , 1922; made Moana with backing of Paramount (then Famous Players-Lasky), 1923–25; invited to work for Irving Thalberg at MGM, quit and formed company with F.W. Murnau to produce Tabu , 1928; made Industrial Britain for John Grierson's Empire Marketing Board, 1931; moved to Aran Islands and made Man of Aran , 1932–34; made The Land for U.S. government, 1939–41; hired by Frank Capra to work in U.S. Army orientation film unit, 1942; made Louisiana Story , sponsored by Standard Oil, 1946–48. Robert Flaherty Foundation (later renamed International Film Seminars Inc.) established, 1953. Awards: International Prize, Venice Festival, for Louisiana Story , 1948. Died: 23 July 1951. Anerca: Drawings by Enooesweetof , revised ed., Toronto, 1959. Eskimo , by Edmund Carpenter with Frederick Varley and Flaherty, Toronto, 1959. Article on North Sea , a film by Harry Watt, in Sight and Sound (London), Summer 1938. Interview with Theodore Strauss, in the New York Times , 12 October 1941. "How I Filmed Nanook of the North ," in Filmmakers on Filmmaking , edited by Harry M. Geduld, Bloomington, Indiana, 1971. Flaherty, Frances, Elephant Dance , New York, 1937. Flaherty, Frances, Sabu: The Elephant Boy , New York, 1937. Rotha, Paul, Documentary Film , New York, 1952. Quintar, Fuad, Robert Flaherty et le Documentaire Poetique: Etudès Cinématographique No. 5 , Paris, 1960. Klaue, Wolfgang, compiler, Robert Flaherty , Berlin, 1964. Calder-Marshall, Arthur, The Innocent Eye: The Life of Robert Flaherty , London, 1970. Hardy, Forsyth, editor, Grierson on Documentary , revised ed., New York, 1971. Levin, G. Roy, Documentary Explorations: Fifteen Interviews with Filmmakers , Garden City, New York, 1971. Barsam, Richard, The Vision of Robert Flaherty: The Artist as Myth and Filmmaker , Bloomington, Indiana, 1988. Ramsaye, Terry, "Flaherty, Great Adventurer," in Photoplay (New York), May 1928. Grierson, John, "Flaherty," in Cinema Quarterly (London), Autumn 1934. Rosenheimer, Arthur (Arthur Knight), "They Make Documentaries: No. 1—Robert Flaherty," in Film News (New York), April 1946. Taylor, Robert Lewis, "Profile of Flaherty," in the New Yorker , 11, 18, and 25 June 1949. Grierson, John, "Flaherty as Innovator," in Sight and Sound (London), October/November 1951. "Flaherty in Review," in Sight and Sound (London), November/December 1951. Huston, John, "Regarding Flaherty," in Sequence (London), no. 14, 1952. Manvell, Roger, "Robert Flaherty, Geographer," in The Geographical Magazine (New York), February 1957. Siepmann, Charles, "Robert Flaherty—The Man and the Filmmaker," in Film Book I: The Audience and the Filmmaker , edited by Robert Hughes, New York, 1959. Flaherty, Frances, "Flaherty's Quest for Life," in Films and Filming (London), January 1959. Bachmann, Gideon, "Bob," in Film (London), September/October 1959. Van Dongen, Helen, "Robert J. Flaherty, 1884–1951," in Film Quarterly (Berkeley), Summer 1965. Barnouw, Erik, "Robert Flaherty," in Film Culture (New York), Spring 1972. Corliss, Richard, "Robert Flaherty: The Man in the Iron Myth," in Film Comment (New York), November/December 1973. Zinnemann, Fred, "Remembering Robert Flaherty," in Action (Los Angeles), May/June 1976. "Robert Flaherty," in Film Dope (London), February 1979. Ansara, Martha, "Richard Leacock: Robert Flaherty's Apprentice," in Filmnews , vol. 10, no. 6, June 1980. Serceau, M., and E. Bonpunt, "Le mythe du bon sauvage (de Flaherty à Perrault)," in Cinémaction (Paris), no. 25, March 1983. Lee, R., "Robert Flaherty: Free Spirit," in American Cinematographer (Los Angeles), January 1984. Winston, B., "The White Man's Burden," in Sight and Sound (London), Winter 1984/85. "The Innocent Eye: Robert Flaherty," in National Film Theatre Booklet (London), September 1984. Barsam, Richard, "The Vision of Robert Flaherty," in Sight and Sound (London), Autumn 1988. Eyman, S., "Sunrise in Bora Bora," in Film Comment (New York), vol. 26, no. 6, July-August 1990. Ruby, J., "Speaking for, Speaking about, Speaking with, or Speaking Alongside: An Anthropological and Documentary Dilemma," in Journal of Film and Video (Atlanta), vol. 44, no. 1–2, Spring-Summer 1992. "The Flaherty: Four Decades in the Cause of Independent Cinema," and Mark Langer, "Rethinking Flaherty: Acoma and Hollywood," in Wide Angle (Baltimore, Maryland), vol. 27, nos. 1–4, 1995. 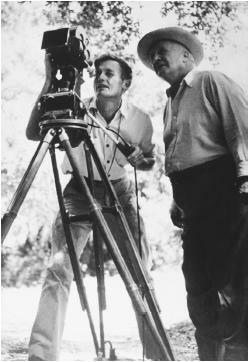 Romine, Charles, producer, Odyssey: The World of Robert Flaherty , for CBS-TV in cooperation with the Museum of Modern Art, broadcast 17 February 1957. Stoney, George, How the Myth Was Made: A Study of Robert Flaherty's Man of Aran , for television, 1978. Robert Flaherty was already thirty-six years old when he set out to make a film, Nanook of the North. Before that he had established himself as a prospector, surveyor, and explorer, having made several expeditions to the sub-Arctic regions of the Hudson Bay. He had shot motion picture footage on two of these occasions, but before Nanook , filmmaking was only a sideline. Yet these years in the wilderness were to have a profound effect on Flaherty's development as a filmmaker. First, the expeditions brought Flaherty into intimate contact with the Eskimo culture. Second, they enhanced his knowledge about the human condition in a natural setting. Third, the numerous evenings that he spent in isolation encouraged him to contemplate the day's events by writing in his diaries, from which he developed highly skilled powers of observation which sharpened his sense of photographic imagery and detail. Also a violinist and an accomplished storyteller, Flaherty had clearly cultivated an artistic sensibility before becoming a film director. Filmmaking became a compelling mechanism for expressing this sensibility. Flaherty turned to filmmaking not only as a means of creation but also to communicate to the outside world his impressions of Eskimo culture. He held a profound admiration for these people, who lived close to nature and whose daily existence was an unrelenting struggle to survive. The struggle ennobled this proud race. Flaherty sought to portray their existence in a manner that would illustrate the purity and nobility of their lives, a purpose underlying each of his films. Flaherty developed a method of working that was fairly consistent from film to film. The films about the people of Hudson Bay, Samoa, the Aran Islands, and the Louisiana Bayou demonstrate a more or less constant concern with people who live in natural settings. These geographical locations are incidental; others would have done just as well. Eskimo culture was the only one in which he was deeply versed. Nevertheless, the locations were chosen because they represented societies on the verge of change. Indeed, Flaherty has often been criticized for presenting his subjects as they existed years ago, not as he found them. But Flaherty saw his projects as the last opportunity to capture a way of life on film. Another consistent feature of Flaherty's technique was the selection of a "cast." Although he pioneered the use of real people to reenact their own everyday lives before the camera lens, he deliberately chose ideal types on the basis of physical appearance and even created artificial families to act before the camera. Flaherty worked without a plot or script, allowing for a maximum of improvisation. The Flaherty method entailed total immersion in these cultures in order to discover the basic patterns of life. Nanook represented the least difficulty because of his thorough familiarity with Eskimo culture. However, Moana and Man of Aran represented unfamiliar territory. Flaherty had to become steeped in strange cultures. His search for struggle and conflict in Savaii misled him and he later abandoned it. Struggle was more readily apparent in the Aran Islands, in terms of conflict between man and the sea; the hunt for the basking shark which he portrayed, abandoned in practice some years earlier, helps the audience to visualize this conflict. Flaherty's technical facility also served him well. Generally he carried projectors and film printers and developing equipment to these far–off places so that he could view his rushes on a daily basis. Flaherty, a perfectionist, shot enormous quantities of footage for his films; the lack of a script or scenario contributed to this. He went to great lengths to achieve photographic excellence, often shooting when shadows were longest. In Moana he used the new panchromatic film stock, which was much more sensitive to color than orthochromatic film. He pioneered the use of long lenses for close-up work, a method that allowed him an intimacy with his subjects that was novel for its time. Flaherty's films were generally well received in the popular press and magazines as well as in the more serious critical literature. Nanook was praised for its authenticity and its documentary value as well as its pictorial qualities. John Grierson was the first to use the term "documentary" to describe a film when he reviewed Moana. Subsequently, Grierson, through his filmmaking activities and writings, began to formulate a documentary aesthetic dealing with social problems and public policy, subjects that Flaherty (except for The Land ) tried to avoid. Nevertheless, Grierson's writings, which were to influence the development of the modern sponsored film, had their foundations in Flaherty's work. Their purposes were ultimately quite different, but Grierson gave due credit to Flaherty for working with real people, shaping the story from the material, and bringing a sense of drama to the documentary film. Man of Aran aroused the most critical responses to Flaherty's work. It was released at a time when the world was beset with enormous political, social, and economic problems, and many enthusiasts of documentary film believed it was irresponsible and archaic of Flaherty to produce a documentary that made no reference to these problems or concealed them from public view. Louisiana Story , on the other hand, was greeted as the culminating work of a master filmmaker. Recognized for its skillful interweaving of sound and image, one critic described the film as an audiovisual symphony. However, in today's world of pollution and oil spills it is much more difficult to accept the film's picture of the oil industry as a benign presence in the bayou. Although Flaherty made a relatively small number of films in his long career, one would be hard pressed to find a more influential body of work. He always operated outside the mainstream of the documentary movement. Both he and Grierson, despite their contradictory purposes, can be credited with the development of a new genre and a documentary sensibility; Flaherty by his films, Grierson by his writing. Watching today's 16mm distribution prints and video cassettes, it is often difficult to appreciate the photographic excellence of Flaherty's work. Nevertheless, the clean lines are there, as well as an internal rhythm created by the deft editing touch of Helen Van Dongen. Although his films were improvised, the final product was never haphazard. It showed a point of view he wished to share.